The US has hinted it may take its own action in Syria, unless the UN Security Council takes action to prevent the use of chemical weapons in Syria. It comes after a reported chemical weapons attack in the Idlib province, which rebels blamed on Damascus. 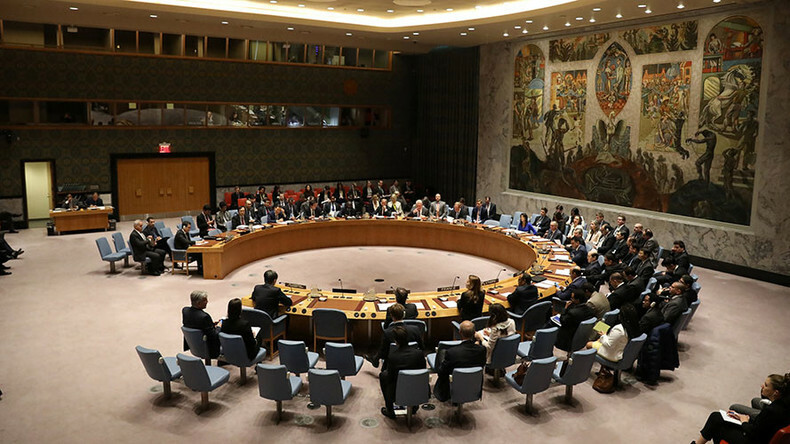 The UN Security Council convened on Wednesday to discuss a draft resolution proposed by the US, the UK and France, which would condemn Damascus for the reported chemical weapons attack in the town of Khan Sheikhoun on Tuesday morning. Nikki Haley, the US ambassador to the UN, delivered an emotional speech that included images of children to argue in favor of swift action. 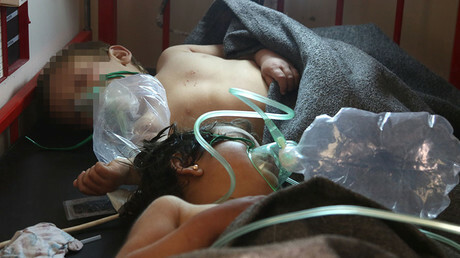 The pictures were used in reporting of the alleged chemical weapons attack. She claimed the incident carried “all hallmarks” of an attack by Damascus, adding that the toxin used in the alleged assault was “more deadly” than in previous cases attributed to the Syrian military by Washington. US envoy to UN also accused Russia of failing to ensure that there were no chemical weapons in the possession of the Syrian government. “The truth is that Russia, Iran and [Syrian President Bashar] Assad have no interest in peace,” Haley claimed. The US has hinted at taking its own action in Syria unless the UN Security Council moves to prevent the use of chemical weapons in the war-torn country. “When the United Nations consistently fails in its duty to act collectively, there are times in the life of states that we are compelled to take our own action,” the US ambassador to the UN said. Russia criticized the draft resolution for being unbalanced and jumping to conclusions. It said the document would have to include several amendments, such as calling on the rebels controlling the area to provide full access to UN investigators and setting an unbiased and comprehensive probe into the incident as the primary goal of the resolution. “This draft was penned in haste and adopting it would have been irresponsible,” the Russian deputy acting envoy to the UN, Vladimir Safronkov, said. He also blamed Western members of the UNSC for unwillingness to investigate previous cases of alleged use of chemical weapons in Syria, where rebel groups were accused of using toxin agents. Safronkov said that it was premature to adopt a separate Security Council resolution over the alleged chemical attack in Idlib, as earlier adopted documents were sufficient to provide for its thorough investigation. The deputy envoy stressed that Moscow supports the calls voiced by UN Secretary-General Antonio Guterres for a full and objective probe of the alleged chemical attack. 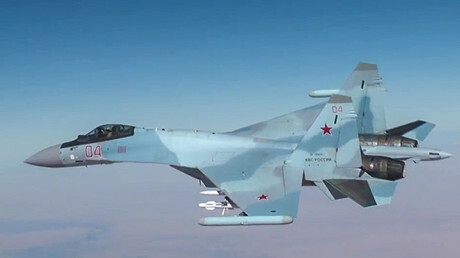 Russia considers the use of chemical weapons by any of the warring parties in Syria “unacceptable,” he said, adding that the perpetrators must be held responsible. "We should put an end to the useless practice of carrying out investigations remotely," Safronkov said, adding that experts must travel to Khan Sheikhoun and use all available methods in their inquiry, instead of relying on “unverifiable” data from the internet. According to the deputy envoy, the Syrian authorities are also interested in establishing the truth about the attack. Damascus will soon address the Organization for the Prohibition of Chemical Weapons, asking for a mission to be sent to Syria to look into the incident, he added. Later on Wednesday, Russia introduced its own draft resolution on the investigation of the alleged chemical attack in Idlib to the UN Security Council in response to the document prepared by the US, UK and France. The consultations on the Russian draft have already begun, with the UN Security Council to continue its session as soon as a compromise is reached, the press secretary added. Earlier the council was briefed by Kim Won-soo, the UN high representative for disarmament affairs, who acknowledged that the organization so far has no independent evidence on the suspected chemical weapons attack. The Korean diplomat expressed grave concern over the media reports on the incident, saying that if confirmed, it would constitute the deadliest use of chemical weapons in Syria since the Ghouta attack in August 2013. Kim reported that all chemical weapons declared by the Syrian government had been removed and destroyed. Verification for a handful of sites has not yet been completed by the Organization for the Prohibition of Chemical Weapons due to security concerns, he added. He also said that chemical weapons inspectors are currently in the process of finalizing their findings on several cases of the reported use of chemical weapons in Syria over the past several months. The report will be available in several weeks, Kim said. Former Pentagon official Michael Maloof said the UN needs to take the initiative in its hands to prevent the “effort to try and ratchet things up” in Syria over the alleged chemical attack. “What the UN needs to do… [is to] call in a fact finding team, get there on the ground and look at it for themselves. I was hoping that Russia could invite the US to bring in officials to jointly do such an examination… under the UN's auspices,” he said.